The road bridge on the A75 autoroute, the highest bridge in the world - taller than the Eiffel Tower. Note the scale by the houses on the edge of the town of Millau, and in particular the old bridge over the river Tarn. In the above panorama the bridge is just visible on the left against the darker hills. This gives some idea of the scale of the undertaking and also shows how something so modern can harmonise with its surroundings. 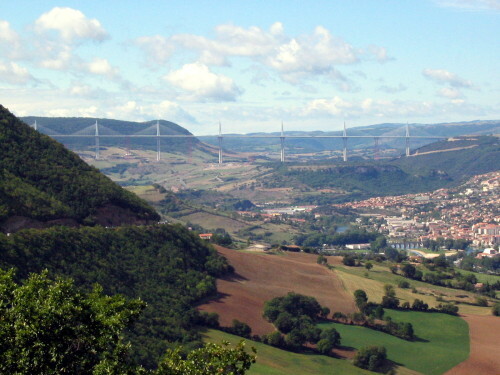 The saving in time and distance compared to the old route through the center of Millau is amazing and the town has benefitted by not having the constant problem of traffic holdups, Millau is a much more attractive town and well worth a visit now that you can get there and park.